I love the Spurs, I really do. I respect the culture. I appreciate the consistency of having the same head coach for over twenty years. I love that Tim Duncan, Manu Ginobili, and Tony Parker are the winningest Big 3 of all time. I love that they made sacrifices to keep the team relevant throughout their tenure. When I found PoundingTheRock.com I discovered a community that felt more or less the same as I did. Whether it was an entire life or a few seasons, whether they were from San Antonio or a foreign country, there is a camaraderie that flows from what it means to be a Spurs fan. Two years ago I started by writing a few Fanposts. I sent some pieces to PtR’s editor-in-chief J. R. Wilco, and soon thereafter I was invited to submit an article for the home page. Ever since then I have had many opportunities that I never imagined. The most recent was the opportunity to join the press. 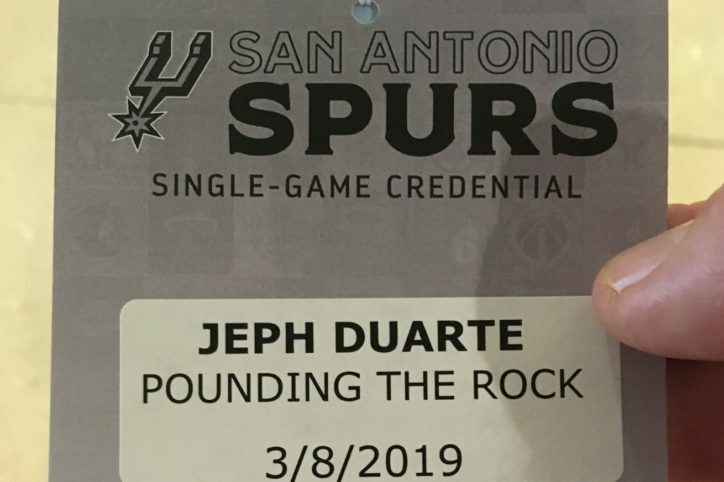 Earlier this month, the Austin Spurs travelled down I-35 for what has become an annual trip to play in San Antonio, and for the first time since joining PtR, I had media credentials. It was quite an experience. For starters, I had never been that close to the action. The physicality of the game is more tangible two rows back from the inbound line. After the game came an experience I’d never thought imaginable. I was ushered to the area just outside the locker room and joined a group of reporters to be involved with postgame activities. First came Drew Eubanks followed by Lonnie Walker IV who shared some mutual admiration and good-natured ribbing. 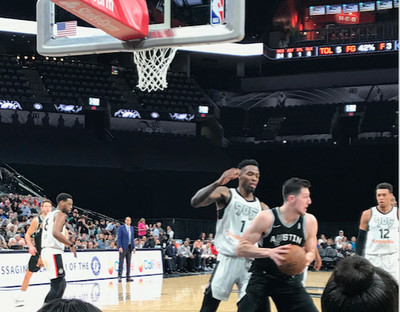 Austin Spurs head coach Blake Ahearn followed the two faces of this year’s G-League affiliate. Although I did not get up the courage to ask a question, I was provided with insight on how to handle the questioning and setting the interview up for an optimal response. There is an etiquette and technique despite the appearance of randomness that dominate postgame activities fans are accustomed to viewing. There was also this moment, just before they stepped in front of cameras, before the light his their faces, before the questions are asked when they were just visiting with others. There’s a genuineness that goes into speaking with journalists, especially after a loss. Spending time immediately after, compartmentalizing the evening without teammates, without having the opportunity to even decompress. For young players I have to imagine it is a talent that has to be shaped and honed, on top of the skills for which the player really got involved with the sport to begin with. As you can see from these clips, all three men were not just positive about the experience, but reflective. Articulating that requires a different level of talent. But asking them to do so necessitates respect. Seeing that firsthand was an education unto itself. 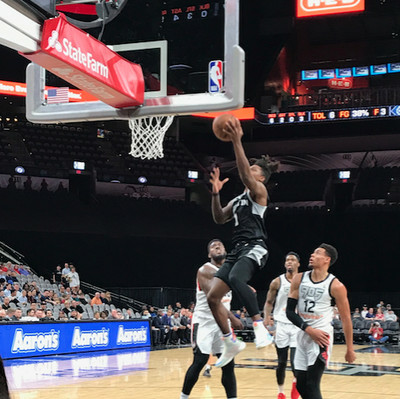 My thanks to the Austin Spurs for coming up to San Antonio and showing us the future of the franchise. And for opening the door to a fan who has participated in more than he anticipated, seen more than he imagined, and has been enlightened and inspired by what would be considered by most to be a hobby. I think we all know true Spurs fandom is not just an amateur interest.